or ……. Why is there a Two in the Length and Surface Estimation Formulas? The number of intersections encountered is proportional to how much length or area there is. This makes sense on an intuitive level, the more times the probe hits the strings or surfaces, the more there is. Even ants know this (Mallon and Franks, 2000). So it makes sense that intersection, I or Q, is in the numerator of these formulas. It also can be appreciated on a gut level that the size of the probes will affect the estimate. If the same number of intersections is obtained with a larger probe, there is less length or surface present. That is why the area of the probe for length (A) and the length of the probe for surface (L) is in the denominator of these formulas. But where does the two come from? Why is it twice the number of intersections per probe size that gives an estimate of the length or the surface per volume? But this is the result if the probe, the surface created by taking a cross section, is perpendicular to the strings. What if the cross section had been parallel to the strings? No intersections would result and we would think there is nothing there. “The constant ‘2’ in the correct length estimation formula is a consequence of the 50% chance of linear structures in three-dimensional space being intersected by a uniform randomly orientated plane” (Tang and Nyengaard, 2004, p. 251). Therefore, and this can be grasped on an intuitive level, this formula underestimates length. That is why the ‘two’ is added, to ‘make up for’ this underestimation; but in my opinion the choice of two is not so obvious. So let’s try to understand, on a mathematical level, why the ‘two’ is in the formulas. Where did these formulas come from? They are certainly well accepted; Baddeley, Gundersen and Cruz-Orive (1986, p. 261) refer to these relationships as “familiar facts”. The reference I have often seen given is from Saltykov from 1946; which is published in Russian. We have to go back much farther in time though to get to an origin of these formulas, to the 1777 paper from George Louis Leclerc, Comte de Buffon, published in French. Cruz-Orive (1997, section 3.1, From Buffon to the Spatial Grid of Planes, p. 96) writes that the problem that Buffon proposed and solved “encapsulates the essence of geometrical probability, and lies therefore at the root of stereology”. All discussion here is ‘after Saltykov’ and ‘after Buffon’ mostly from Cruz-Orive (1997) and Smith and Guttman (1953) but there is also a derivation in Gokhale, 1989 (Section 2, Theory, p. 134). What Buffon did was to empirically figure how the probability of the occurrence of an intersection is affected by the size of the probe relative to the amount of strings or surface that is being studied. He used a two-dimensional model system; a floor with floorboards. The cracks formed by the joining of the boards were at a known distance from each other, ‘h’. He used a line-segment of a known length, referred to as a ‘needle’, whose length, ‘b’, was less than the spacing among floorboard cracks. He threw the needle down over and over again in a random way to assure an isotropic interaction and kept track of the number of intersections with the floor board cracks verses the number of throws. After just 176 tosses we came close to what Buffon demonstrated, obtaining 81 intersections. Cruz-Orive (1997, section 3.1, From Buffon to the Spatial Grid of Planes, p. 96) talks about the probability of an intersection as the number of favorable cases divided by the number of possible cases. The distance between the lines on the floor, h, can be thought of a measure of all possible positions of the thrown needle; if h = 0 there are no possible positions and if h = infinity, there are infinite possible positions. Twice the length of the needle, 2b, divided by π, or the average orthogonal projection of the needle on a perpendicular axis (Smith and Guttman, 1953, equation , p. 82 , note the needle length is called l instead of b by Smith and Guttman), is a measure of all favorable cases. The projection (l in the figure above) is equal to the length of the needle (b) times the cosine of the angle between the needle and the perpendicular axis. When the needle is parallel to the perpendicular axis it is perpendicular to the lines on the floor, giving the best chance for an intersection. When the needle is perpendicular to the axis and thus parallel to the floorboards, there is the least chance for a favorable position. The angle must be isotropic and the distance from the center of the needle to the lines on the floor must be uniform random. Isotropic-uniform-random is abbreviated as IUR (Miles and Davies, 1976). The length per area of a two-dimensional curve probed with line-segments of length L is π/2 times the average number of intersections encountered divided by the length of line-segment-probes. Theta is the angle between the perpendicular axis and the needle. Phi is the angle around the perpendicular axis. To ensure isotropy, theta must be randomly picked between 0 and 90 degrees, but then phi must be sin-weighted. In other words, an element of area on a sphere defined by phi and theta is not simply [d(theta)*d(phi)], instead it is [(sin theta)d(theta) * d(phi)]. The length of a projection on the perpendicular axis (lp) is a measure of favorable positions or hits of the needle on the planes. probability of an intersection = favorable positions/all possible positions = (l/2)/h = l/2h (Cruz-Orive, 1997, section 3.1, From Buffon to the Spatial Grid of Planes, pp. 96-97). We finally arrive at the relationship: the length per volume is equal to the number of intersections counted per area of probe. This equation is considered to be due to Saltyokov (1946) and rediscovered by Smith and Guttman (1953) (Baddeley and Jensen, 2005, section 2.11, bottom of page 52). Notice it can be rearranged so as to recognize its origins in this equation: Lv = 2Q/A. Surface area per volume equals twice the number of intersections counted per length of probe. Notice how this equation can be rearranged to identify its progenitor: SV = 2IL . Baddeley, A.J., Gundersen, H.J.G., and L.M. Cruz-Orive (1986). 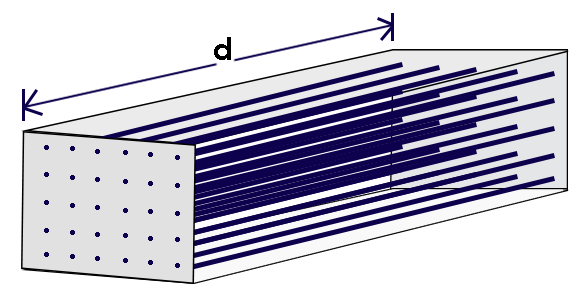 Estimation of Surface Area from Vertical Sections. J. of Microscopy, 142, 259-276. Baddeley, A. and E.B.V. Jensen (2005). Stereology for Statisticians. Chapman and Hall/CRC, Boca Raton, Florida. Buffon, G. “Essai d’arithmétique morale.” Histoire naturelle, générale er particulière, Supplément 4, 1777. Cruz-Orize, L.M. (1997). Stereology of Single Objects, J. of Microscopy, 186 pp. 93-107. Evans, S.M., Janson, A.M, and J.R. Nyengaard (2004). Quantitative Methods in Neuroscience. Oxford University Press, New York. Gokhale, A.M. (1989). Unbiased estimation of curve length in 3-D using vertical slices. J. Microsc., 159, pp 133-141. Howard, C.V. and M.G. Reed (2010). Unbiased Stereology Second Edition. QTP Publications, Coleraine, U.K.
Kubínová, L and J. Janácek (1998). Estimating surface area by the isotropic fakir method from thick slices cut in an arbitrary direction. J Microsc. 191(2):201-211. Mallon, E.B., and N.R. Franks (2000). Ants Estimate Area Using Buffon’s Needle. Proc. Roy. Soc. London B, 267, 765 – 770. Mouton PR, Gokhale AM, Ward NL, West MJ. (2002). Stereological length estimation using spherical probes. J Microsc., 206, pp 54-64. Miles, R.E., and P.J. Davy (1976). Precise and General Conditions for the Validity of a Comprehensive Set of Stereological Fundamental Formulae. J. of Microscopy, 107, 211 – 226. Saltykov, S.A. (1946). 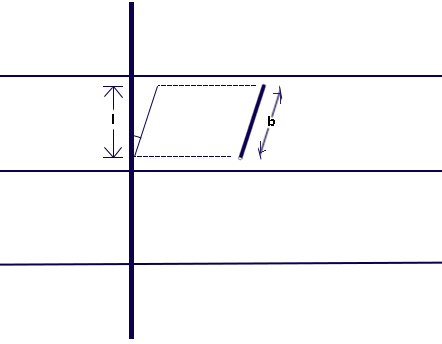 The Method of Intersections in Metallography (in Russian). Zavodskaja laboratorija, 12, 816-825. Smith, C.S., and L. Guttman (1953). Measurement of Internal Boundaries in Three-Dimensional Structures By Random Sectioning. Transactions AIME J. of Metals, 197, 81 – 87. Tang, Y. and J.R. Nyengaard (2004). Length Estimation of Nerve Fibers in Human White Matter Using Isotropic, Uniformly Random Sections. Evans, S.M., Janson, A.M, and J.R. Nyengaard, Quantitative Methods in Neuroscience, Chapter 12, Section 1.1, Oxford University Press, Oxford. Weibel, E.R. (1979). Stereological Methods. Vol. 1. Practical methods for biological morphometry. Academic Press, London.